While browsing my blog feed, I came upon the 31 Day Challenge through The Nester. The goal of the task is to find something that you know a little about, what to learn more about and can blog about for 31 straight days. 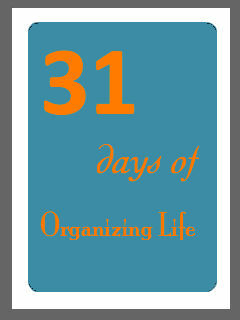 After skimming through the thousands of ideas I not only decided to participate, but also to make my 31 Day focus on Organizing Life. For 31 straight days, I’m going to dedicate time each day to getting my act together and organizing my personal and professional lives. Enough of making lists and not following through with them. That pile of crap in the office, GONE! All the holiday decorations that are thrown in the storage will find a new home. Henry’s toys, clothes and everything else he owns. All of it is getting organized. My hope is not only to come to terms with my hoarding problem, but planning life out a little better. Maybe I’ll learn something about myself along the way and hopefully have fun doing it. Time to put all those good Pins to use! !